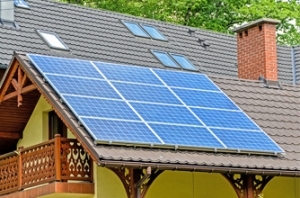 Solar panels are expensive pieces of equipment that can catch the eye of opportunist thieves. Thankfully, solar panel theft is relatively rare but that doesn’t mean that you need to need to take precautions and be sure that your panels aren’t at risk of being taken. Often you’ll only need to make a few small changes to your property to have the peace of mind that your solar panels are secure. Here, Dakota Murphey, independent content writer for gives you six top tips to help you minimise the risk of your solar panels being stolen. The first – and arguably most important – step to take is to ensure that your panels are insured. You might assume that your standard home contents insurance covers the new panels that you have had installed, but this is not necessarily the case. At the very least you will need to inform your insurance company that you have had the panels installed and they can then be added to your insurance – it may not affect the premiums you pay. In some cases it may be necessary for you to take out a separate policy to make sure that they are insured. Of course this will not stop the actual theft of the panels themselves, but it can ensure that you are protected in the event of them being stolen. This is another piece of advice that will not prevent the panels from being stolen in the first place, but can make it much easier for you once the theft has occurred. You should make sure that you have a note of the serial numbers of your panels so that if they were to be stolen you could make it much easier for police to track them down and locate the thieves. Once again, this can give you peace of mind to feel that your panels cannot be stolen with no recourse for action. Some guides and companies recommend that you use an anti-theft screw that can be locked with a unique key. Only that key can unlock the screw which makes it much harder to remove the panels. In theory this is a very good idea. But the problem is that you would have to screw into the frame of the panel. In the case of many manufacturers, doing so would invalidate the warranty, so in trying to keep your panels secure you can end up losing the warranty cover. Given that the risk of solar panel theft is relatively low, it’s probably not worth it as there are better ways to protect your panels. Think about general issues surrounding home security as these are the most relevant to ensuring that your solar panels stay safe. For example, installing higher fences or putting locks on garden gates can go a long way to make your panels simply harder to access. For many thieves this is enough of a deterrent to move on from your property and leave the solar panels alone. It should also go without saying that you shouldn’t leave any ladders around which thieves could use to easily access the panels. One very valuable piece of technology in defending your solar panels against theft is the motion-detecting light. These lights are triggered by movement so that you can see if anyone is attempting to gain access to your property. This acts as the perfect deterrent as most thieves will run if they think there is a chance that they might be seen. Something as simple as a motion detecting light will keep your panels safe even if you’re not at home. Finally, as a last line of defence, it is worth installing an alarm to sound if someone attempts to remove your solar panels. For those thieves who were undeterred by the motion sensing light, this can be enough to get them to abandon their plans.